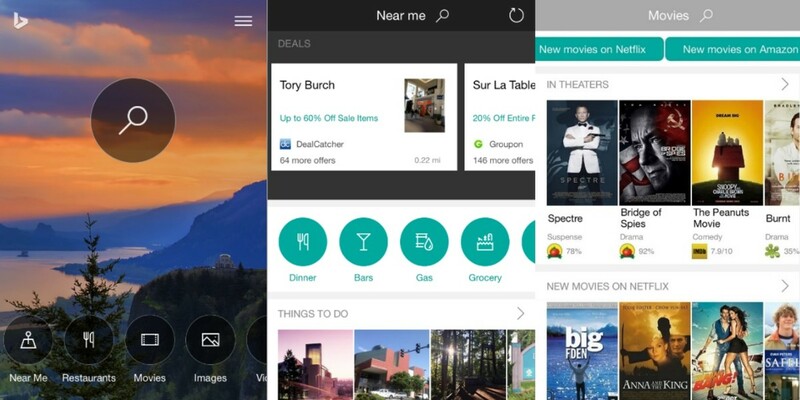 Microsoft is about to make the Bing app on iOS a lot more useful. Featuring a complete redesign, the new app is focused on helping you find things to do and the news you care about without having to type anything at all. Near Me highlights interesting business and locations close to you. Restaurants does what you expect, allowing you to see information on ratings, menus and deals while also letting you order delivery or set up reservations. Movies surfaces interesting new additions on Netflix, Amazon Prime, Hulu and other services, and you can also sort it by genre. Images and Videos shows off trending people or animal searches (AKA cute cats and puppies), as well as music videos and other viral content. Music lets you listen to songs and watch videos, and even follow along with lyrics for some homemade karaoke. Books points out interesting new titles and classics, as well as the different e-book sources to read them. People helps you do quick research on important figures including bios and images. Then there’s also a News section, which you slide up from the bottom to read a selection of trending articles. Of course, you can still type things into a search bar – which still occupies the central portion of the app – but the point is that for many of the things you want to look up, you won’t have to. Microsoft is also placing a heavy emphasis on deep-linking; tap on a Netflix movie, for instance, and it will take you not just to the Netflix app, but straight into playback for the specific video. The company also emphasized that it doesn’t have any partnerships to skew the selection of apps linked to – it will simply take you to whatever the most relevant app for a given piece of content is. And if you don’t have the app installed, it’ll point you to the right place in App Store. It’s an interesting approach for Microsoft; rather than trying to directly replicate the Google app’s information cards based on your personal information, it wants to become your information hub for anything you might want to look up. It means being able to discover news and content, rather than always knowing what you’re looking for, or being spoon-fed suggestions based on your personal information. While Bing’s unlikely to catch up to Google any time soon, the specialized approach could help the company solidify its own niche.